A pleasure to be involved in Lucy’s Bat Mitzvah celebration held at the Pointing Dog in Cheadle Hulme, Cheshire. Lucy’s parents had booked experienced DJ Andy B to host an informal party at this contemporary bar & restaurant in Cheadle. The party was mainly for her friends although there were several family members also in attendance. 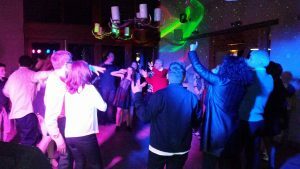 We started with background music through the drinks reception, then speeches & video presentation in a separate area which we provided the PA & microphone for & then it was party time! Not much in the way of formalities or any traditional Israeli music on this occasion, just a mix of current chart & party favourites to keep guests dancing the night away!